When you start a trial or purchase seats for Conversations, the email channel will be turned on by default. This makes it easy to continue the conversation with a visitor who submits a chat and email address but is no longer online. 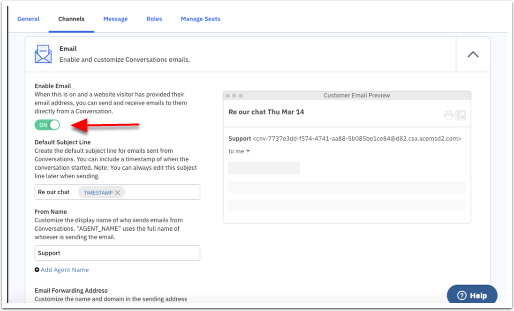 In addition, you can create a custom forwarding email address and forward inbound emails from your personal inbox to the unified Conversations inbox. Only the Primary Account admin can configure the Conversations email channel and set a forwarding email address. In order to send a visitor an email from the Conversations inbox, they must submit their email address to you. Emails sent from the Conversations inbox are transactional only. They should not be used to send marketing communications to contacts. Anyone with Agent access to Conversations can view and reply to emails messages. The Conversations email channel can be customized on the Conversations Settings page. Click “Settings” in the left menu. Click the “Conversations” option in the left menu. The Conversations channel page will load and display both chat and email channels. As a reminder, Conversations Email is enabled by default when you start a trial or purchase seats. To turn off the email channel at any time, set the “Enable Email” toggle to off. As you customize the email option for Conversations, you’ll see a preview of how the email will look on the right side of your screen. For every email you send from the Conversations unified inbox, you can use a default subject line. For example, you can use “Follow-up from our conversation” or “Regarding our chat” as your default subject line. Creating a default subject line makes it easy to quickly send email replies to your contacts. Note that you can always edit the subject line when you send an email later. To create a default subject line, type the subject line into the field provided. Note that you can also include a timestamp of when the conversation started. If you wish to remove the timestamp, click the “X.” To re-add the timestamp, click the “Add message timestamp” option below the subject line field. A “From Name” is the name that will appear in the “From” line of your email correspondence. When a contact receives your email, they’ll see that the email is from you. To customize the “From Name,” type it into the field provided. You can also customize this option to dynamically display an agent’s name. To do so, click the “Add Agent Name” option below the From Name field. When an email is sent from your Conversations inbox, the “Agent_Name” tag will be replaced with the full name of the person sending the email. With Conversations, you can create a single email address that will route inbound emails into your Conversations inbox. Note that once this email address is configured, the custom forwarding email address cannot be changed. Forward emails from your other email providers to the Conversations unified inbox. Once the message is forwarded to the unified inbox, you can view it and reply to it. In addition, email correspondence will appear on the contact’s profile page under “Conversations.” If an email message from an unknown individual is redirected to your unified inbox, a new contact profile record will be created for them and the email conversation will be captured. Note that email conversations will not display in the Recent Activity stream on contact profile pages. Have replies sent to campaigns and automation emails forwarded to your Conversations Unified Inbox. Once you’ve configured your email forwarding address, you can then copy and paste that email address into the “Reply-To” field for your campaigns and automation emails. Note that you’ll need to ensure that Reply Tracking is enabled in order for replies to be forwarded to your unified inbox. See how to enable reply tracking for campaigns and reply tracking for automation emails. To create a forwarding email address, you’ll need to set the username and subdomain of the email address. To do so, type the username into the field provided. This field appears before the @ symbol. Next, type the subdomain of your email address into the field that follows the @ symbol. The subdomain of your email address is typically your company name, or whatever follows the @ symbol in your email address. The end of your forwarding email address will include “ac-inbox.com.” This cannot be removed.